Have you every noticed that some lawns like the spring more than other lawns? It may seem weird at first, but when you think about the complexity of the lawn, it is not so weird after all. In Michigan home lawns, there are three desired main species of grass, Kentucky bluegrass, perennial ryegrass, and fine fescue. Of those three species, there are hundreds of cultivars (subgroups). With that being the case, your lawn will have multiple varieties of grass in it, but your neighbor’s lawn may have different varieties. Each of these varieties have different characteristics that make them unique. Some are more drought tolerant, some are more disease resistant, some are a dark green, some handle foot traffic better, etc. Each variety of grass is unique, and each will act differently in different situations. The same is true for the spring green-up. Some varieties tolerate the cooler temperatures of spring better than others. 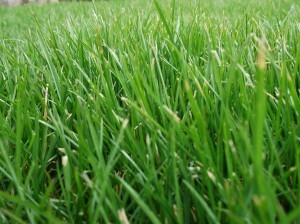 It is just part of the characteristics of that individual variety of grass. When it is more cold tolerant, it will green up and start to grow sooner than those varieties that are not. The same is true for the heat of the summer, there are some varieties that will tolerate the heat better and stay green longer. It is just the differences in the grass.